Finally, this past weekend, I joined facebook, which meant I could join Pinterest too. (in case you want to take a peek). I've been looking at map photos (among many other things)....can you tell? and you can learn how to make those pretty coasters at the top of the post *here*. Aren't they perfect for summer ? You are not alone Marcia. No Twitter, no Facebook and even no cell phone here... I think I am the only woman here in Luxembourg without a cell phone! LOVE the maps, the colors are soooo pretty! Have a most blessed day my friend, HUGS! 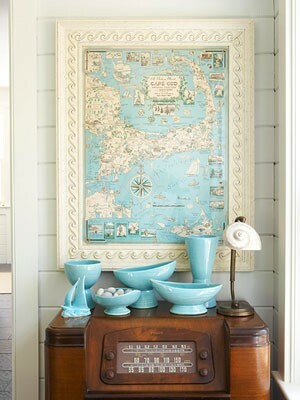 I like maps as decor, and I have one hanging in my hallway. Hi marcia, I have a facebook account and seldom go on it as I really don't care for the fragmented thoughts . I have a FB account, and like to go on the see what is up with my family, though I don't post very often. It is good for that purpose, but watch out you don't get sucked in playing the games...they can take up your time. I love those coasters! Have fun with your new accounts. My hubby and I joined FB last Fall (due to family pleading with us to). It is hard keeping up with all of it! I try to for my family though...:) Enjoy, and happy weekend to you! I'm not on Pinterest yet, but some of my photos are. I keep getting views on my blog from that site. Alanna would LOVE those coasters. hmmmm, birthday idea! I just joined pinterest myself. I love the inspiration but don't know how much time I'll have to pin anything. 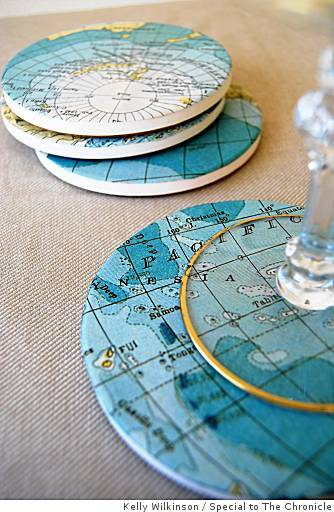 The map coasters are beautiful...love that blue color. Such lovely photos, Marcia! I love pinterest, it's so nice to be have a place to collect inspiration images. The nice thing is that they link to the place where you found them, so it's easy to save a photo from a tutorial that you love and find it back later, for example. 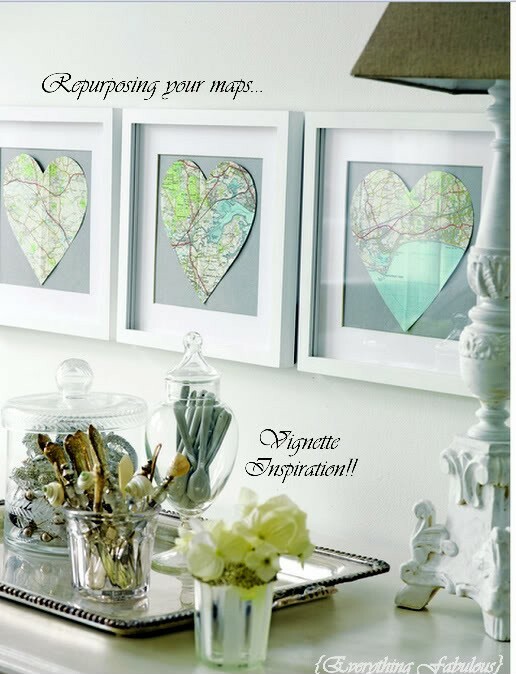 I really love maps too - in fact, I added one of the photos you used to one of my own pin boards. :) Thanks for sharing. Marcia those ooasters are amazing..I love them!! And the maps in heart shape..right up my alley!!!! I love the colors, but I would have to say I dont know about Pinterest. Thanks, for the info. yes I do FB, but only have my blog posts feed. It is nice to share with the family. Love the coasters! I have a fb account but I use it mostly for family...we are kind of spread out across the whole country. So soothing and pretty! I just joined Facebook so you're not the only one that's taken their time in doing so! I'm staying away from Pinterest - everyone says it's addicting! I am so jealous! i have requested to join pineterest twice! And I have gotten no response. I want to join so badly I don't know what to do! What am I doing wrong?! I agree- maps are so cool!! I love my food items/recipes I've stashed there. THESE MAPS are to die for!!! I came over thinking about Jordan. I will keep reading and see if there is an update.